Each reader and writer added to a workspace contains distinct format parameters. These parameters differ from format to format, and even from reader to writer of the same format. They control how data is read or written, and can apply to an entire reader/writer or to an individual feature type. Reader/writer parameters are easily identified in the Navigator. The parameters apply to everything beneath them; that is, all datasets being read and all features types within those datasets. Some Reader (and Writer) parameters are only accessible through the Parameters button when you initially create a workspace or add the Reader/Writer to an existing workspace. This is because these parameters affect how the schema is read and therefore how the workspace is constructed. If you make a mistake when you set one of these parameters, you can always re-create the workspace. Feature type parameters are accessible only with certain formats (like databases) and are at a lower level in the Navigator hierarchy. You can also access them through the Feature Type dialog. For information about generic parameters, see Reader Parameters. 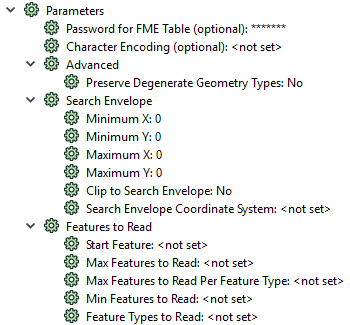 For format-specific parameter information, refer to the FME Readers and Writers Help for the applicable format. To edit a parameter, double-click it. A dialog opens and you can edit the parameter’s value.